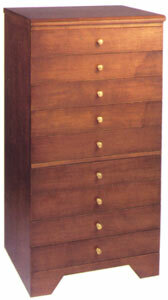 Traditional Sheet Music Cabinet by Jansen is rated 4.31 out of 5 based on 13 ratings. This elegant cabinet in constructed with solid hard maple drawer fronts with top and sides as a maple veneer. Made in USA by the world renowned Paul L Jansen company. Solid brass drawer pulls. Comes in 3 colors! Walnut (pictured), Ebony and Mahogany. Please note - Hi-gloss Walnut and Mahogany are custom finishes and are not returnable.